In this article I am going to show you an example of android button. A button is the most common widget in any graphical user interface. In this example, We will create a button, add some text or an icon to it and then attach a listener. Add a text field and a button to the layout. We will enter website name in the text field and then click on the button to open it. The button contains some text as well as an icon. The icon is set against the attribute android:drawableEnd. Use button.setOnClickListener to set a listener on the button. When clicked, it should open the site address entered in the text box. You should see a text box and a button. 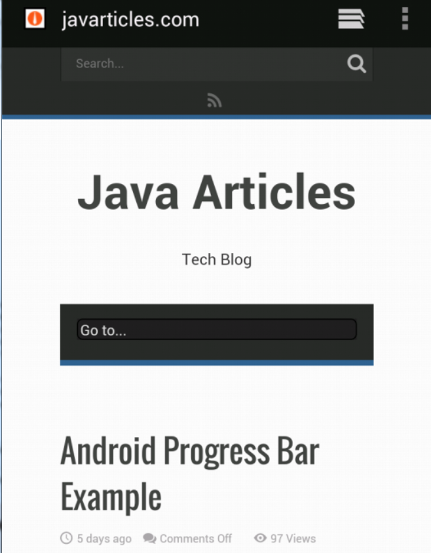 Enter javarticles.com in the text box and click on the button to open the site in a browser. The site gets launched in a browser.